Elysia Agnew works her way to the Sunderland Empire to join the Jersey Boys in a tale of success, stardom and sweeping sopranos. This jukebox musical brings the stories of Frankie Valli and The Four Seasons to life on stage. It tells the biographical tale of a four New Jersey boys from the wrong side of the tracks looking to make their way in the wonderful world of show business. A bit of a history lesson… back in the 1960s, The Four Seasons worked together to find their unique sound, going on to become one of the most successful bands in pop history, selling 175 million records worldwide. The stage show journeys through their rise to stardom. It’s the late 1950s and Tommy DeVito discovers the sweeping falsetto of Frankie Valli. Three of the four original members – guitarist Tommy DeVito, bassist Nick Massi and lead singer Frankie Valli, are knocking about Jersey, performing under various titles, in different styles and experimenting with new band members. It takes some time, but a moment of musical magnificence is born when keyboardist-songwriter, Bob Gaudio joins the group and The Four Seasons are formed. Finally, it clicks. A quartet of polished and precise, finger-clicking men in dapper suits. A new sound, a new image and an iconic moment in music history. The story of The Four Seasons is suitably told chronologically through the seasons. The band is formed in spring as Tommy DeVito steps up to guide us their rise to success, with a handful of musical numbers thrown in for good measure. Bob Gaudio takes over the narration in the summer – this is where it all comes together. The seasons guide us through the coming together of, the rise of, the failings of and the resurrection of The Four Seasons. 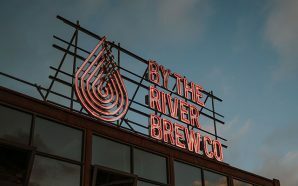 As the seasons change, the group go through several trials and tribulations; testing their relationships, their music and how, together, they handle being in the limelight. Dayle Hodge plays Frankie Valli on this occasion, standing in for the UK tour’s principal Valli, Michael Watson. He returns to Jersey Boys after having recently appeared as the alternative Frankie Valli in the West End production. His vocal range is astounding, impressively mirroring the man himself. His execution of the role is as accurate as can be – perfectly exposing both his vulnerable side in his early years, as well as his becoming of a strong man later in life. The supporting cast includes Simon Bailey (as Tommy DeVito), Declan Egan (as Bob Gaudio) and Lewis Griffiths (as Nick Massi). Their harmonies hit the spot and their vocal togetherness sends a shiver down the spine. When a musical takes you from sitting in the theatre to standing as a concert spectator, you know it’s really working its magic. What’s really special about this production is that the cast are really enjoying themselves. It resonates with audiences who can’t help but toe-tap, clap and bop along. It’s engaging from the off. Straight into those much-loved musical numbers, but with clear narration from the band members. The audience get an insight into each character, their personal lives and their role within the group thanks to the documentary-style story telling. Danny DeVito kicks off the story, guiding us through the getting together and the growth of The Four Seasons. 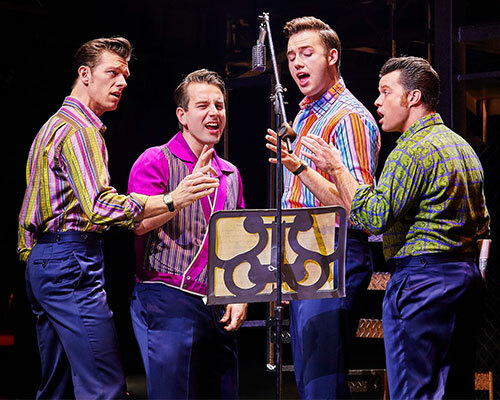 Bob Gaudio’s narration comes as the band fly off into worldwide fame, with musical numbers including ‘Big Girls Don’t Cry’, ‘Walk Like a Man’ and ‘December 1963 (Oh What a Night)’. Act two begins with Nick Massi’s narration as cracks begin to show. Moving numbers such as ‘Stay’ and ‘Bye Bye Baby’ set the tone. Narration aside, each and every musical numbers tells the combined tales of success, stardom and sorrow. It’s an emotional journey through an iconic time in music development – and as an audience, we’re captivated at every moment. 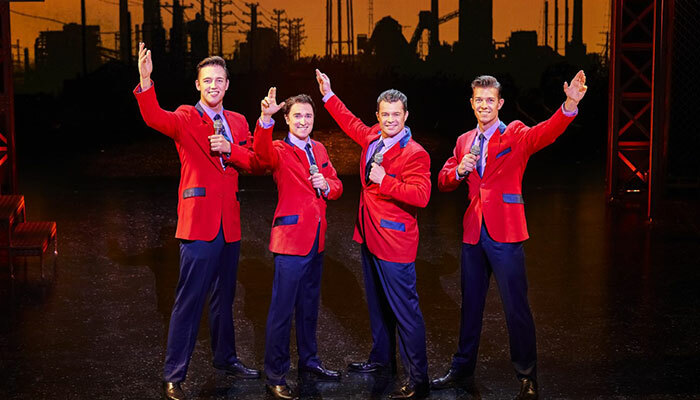 Whether you’re a Frankie Valli fanatic, you favour The Four Seasons or you’re completely new to the story and the songs, this one is sure to have you bopping away to the beats. Personally, I find myself singing every word to every number without even knowing it! It’s a soundtrack to an entire generation. It’s a story, a celebration and a peek into the life behind the big red curtain. What a night! See this sensational show about the boys from Jersey with big dreams at Sunderland Empire now until Saturday 31st March 2018. Get your tickets online.